On May 28, 2014, we went back to the Hannibal Library and then to the Palmyra Library. We found little of additional interest. We went through various shops in Hannibal, including a great antique store that looked like a junkers dream. 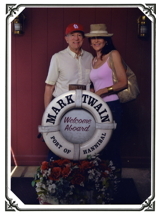 We rode the Mark Twain riverboat up and down from the Mississippi River bridge past various islands and landmarks that figure in Mark Twain's writings. 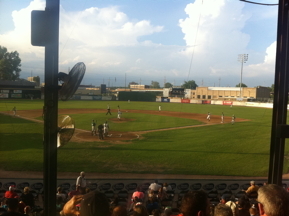 We attended a baseball game in Mark Twain Field between the Hannibal Cavemen and the Quincy Gems, local college teams. During the game the Ringling Brothers Circus train rolled through on the track about a block from the stadium. Play continued as the train went by but the spectators' loyalties were divided, except for the fellow of the large voice directly behind us who kept yelling, "Come on, big boy!" We had dinner at the La Binah, which is across the street from the adult home of Laura Hawkins Fraser , the person on whom Samuel Clemons based the character, Becky Thathcer. 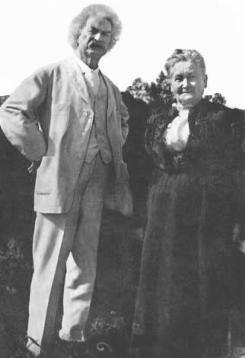 Twain is reputed to have visited her there when he visited Hannibal in the 1870s.